"The Best Small Jeweler in Town!" "Mitchel D Robbins Jewelers is a unique little shop where every customer feels like they are the most important. As soon as you enter, you are greeted by Mitch, the owner. He always has a friendly smile and is ready to help with anything. Even if you need to wait until Mitch is finished with a previous customer, you cannot help but notice Mitch's many collections which he displays in his store. He has many games, containers, and other memorabelia from the 50's and beyond. He also has a Mr. Peanut costume and Spiderman! On the walls hang pictures of each and every customer that has come to Mitch for an important jewelry purchase. Not only is his merchandise top notch, but he as a person is as well. You can tell his commitment to the community by the pictures of the many sports teams that he sponsors, as well as pictures of his childrens' classes that were taken when he came to visit and tell the children about gemology. Forget the big chain stores....I'll go to Mitch Robbins over them any time." Put our expertise to work for you. At Mitchel D. Robbins Jewelers, we are proud to have received the following recognition for our contributions to our customers and the community as a premier provider of services. "My husband recently surprised me for our 10th anniversary with a BEAUTIFUL anniversary band. I love, love the design, as it is an antique style that I love with channeled diamonds around. The service he received was impeccable and he was able to work with Mitch in finding the perfect ring I would absolutely love." 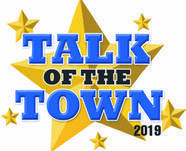 "Commitment to the community" "Forget the big chain stores....I'll go to Mitch Robbins over them any time..."
Voted "Best of the Main Line"
Voted “Talk of the Town 2011, 2012, 2013, 2014, 2015, 2016, 2017 & 2018"
"A great place to do business!" "My husband and I had a wonderful experience at Mitchel D. Robbins. My husband purchased my engagement ring after excellent and honest service. I know my husband’s decision was difficult with their large selection. My husband and I also purchased our beautiful and unique wedding bands at Mitchel D. Robbins. The service was very helpful and personable. One year later and we have already made a trip to buy my anniversary ring! We know we are going to be lifelong customers. I would highly recommend anyone who is in need of jewelry to visit here, they are perfection!" "We know we are going to be lifelong customers." "Mitch is the kind of jeweler that you don't find in every town. He's friendly, he's caring and most importantly, he's "honest". The quality of his work is A+. He will make sure you're pleased with your repairs as well as your purchases, and you'll leave with a smile every time. If quality and professional craftsmanship is important to you, then this is the only place you'll shop for jewelry." "The service he received was impeccable"
"He's friendly, he's caring and most importantly, he's "honest"
"I have been a customer of Mitchel D. Robbins Jewelers for 20 years. He is known for his many donations and contributions to our community. If you are looking for someone you can trust ~ Mitch is the one. Incredible selection and great prices. Great job on all my repairs. I have recommended this jeweler to my friends and family. Thanks Mitch for everything!" "If you are looking for someone you can trust ~ Mitch is the one. Incredible selection and great prices." "Great service! ~ Will definitely be back!" "We are engaged!!! Thank you so much to Mitch for everything - helping and guiding Matt, having the stone re-cut... we couldn't value your assistance, knowledge, and guidance more. THANK YOU!!!" "I was looking for a friendly, small jewelry store, and found it at Mitchel D. Robbins! My 26 yr old diamond needed a prong adjusted. Mitch did the work while I waited, and was so grateful my ring was able to be repaired and worn again. Thank you so much. I will definitely be returning. Thank you." "I was looking for a friendly, small jewelry store"
"I had an awesome experience shopping for diamond stud earrings at Mitchel Robbins Jewelers. He was incredibly knowledgeable and helpful working with me to find a pair that fit into my budget yet gave me the quality and "sparkle" that I had hoped for. Very, very satisfied. I will definitely be going back the next time I'm looking at fine jewelry. I'm pleased to say that I now have a new jeweler. Excellent selection too. Great!!" "I'm pleased to say that I now have a new jeweler." "Mitch did a wonderful job helping me create a custom ring for my now fiancé. He helped pick out a beautiful setting in which we could put her family's diamond. Many other jewelers are about high pressure sales and Mitch was not that way at all. He was very patient and understanding and most importantly, did a fantastic job! We both love the ring and I couldn't imagine going to anyone else. Thanks again Mitch!" "Mitch did a wonderful job helping me create a custom ring for my now fiance." "I absolutely love my custom engagement ring! Mitch was so so helpful throughout the process - where he mostly dealt with my boyfriend, now fiance. Most valuable in the process were two great pieces of advice he provided us. Mitch suggested re-cutting my family heirloom diamond, which was the best advice we'd received. We were having a lot of trouble imagining the diamond in a setting because of chips on the top that came from 70+ years of constant wear - they weren't visible to the naked eye and the diamond looked great in a yellow gold setting, but the color looked so yellow when we placed it in platinum settings. It just didn't look pretty. We met with three jewelers, none of whom recommended re-cutting. A GIA-certified appraisal professional mentioned re-cutting, but advised against it as we'd lose "30%-50%" of the weight. Mitch took one look at the stone and said that he wouldn't even set it as it was, that we HAD to re-cut it and that the stone would look better after all was said and done. The diamond looks 1,000x better and the value more than doubled after losing only 2.5% of the weight! Not that we care about the value, but it shows how important good advice is and how much more beautiful the stone is after re-cutting. I also noticed that many jewelers were pushing us pretty hard toward a four-prong setting. Mitch advised on a six-prong to protect the stone. Jewelers would tell us that we wouldn't be able to see any light reflected with a six-prong, and that if it's a "good" setting there's no need for six prongs. I'm totally convinced that Mitch had our best interests at heart here and that others were motivated more by profit than practicality in their strong and sometimes combative advice. Mitch's prices were reasonable and he's just a wonderful person to work with. Highly recommend him!!!" "I'm totally convinced that Mitch had our best interests at heart here and that others were motivated more by profit than practicality in their strong and sometimes combative advice." 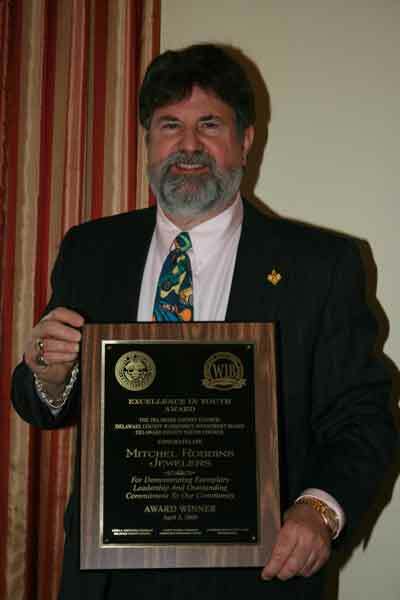 "I have been a loyal customer of Mitchel D. Robbins Jewelers for over 20 years and have always been pleased with everything. Mitch has handled all of my repairs and custom designed pieces. I have always highly recommended him to my family and friends and they too were totally impressed with his expert guidance and quality of work. 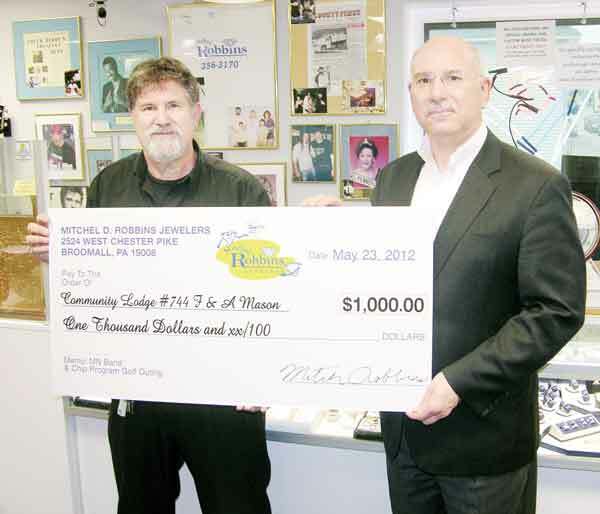 He is known for his many donations and contributions that he has given to our community. He has a wide variety to choose from and his prices are very reasonable. I would not go anywhere else. Thank you again Mitch for everything you do." "I would not go anywhere else. Thank you again Mitch for everything you do." "Mitch is one of the nicest guys you'll ever meet, he is super knowledgeable and has a great selection of beautiful jewelry. He is quite the artist too, he can help you design stunning pieces and his prices are fair and reasonable. I highly recommend stopping by to visit Mitch and see what you can find for yourself! I will definitely be back!!!! Thanks again Mitch!" "He is quite the artist too, he can help you design stunning pieces"
"Had some repairs needed to be made--all were done quickly without a problem and at a very reasonable price...happy to be able to wear my earrings again, thanks so very much!" "Had some repairs needed to be made ~ all were done quickly without a problem"
"My boyfriend purchased a pendant as a Christmas gift for me last year from Mitchel D. Robbins Jewelers. I had originally pointed out a pendant from another store, but the pendant I received was of far better quality and appearance. I wear it every day, and I am always getting compliments on it. Since then, I have brought multiple pieces of jewelry in to Mitch for repairs, and he is always personable and very helpful. I am already scanning his website for my future Christmas and birthday wish list. You are now our #1 jeweler, and we’ll definitely be back! "You are now our #1 jeweler and we'll definitely be back!" "Mitch was exactly the right choice for our needs. We needed a jeweler that understood the understated look my fiance desired and was able to take that concept and provide the perfect match for it. Mitch is also a great listener with a real zeal for customer service. The process was everything he said it would be. Zero surprises. Our custom ring was completed exactly when he said it would be and looked better than promised. I can't imagine needing anything more than what we got and what you can expect. We'll be returning for wedding bands. Thanks again Mitch. You made our special day that much more memorable." "Our custom ring was completed exactly when he said it would be and looked better than promised!" "Thanks Mitch for helping create such a beautiful symbol of our love." As a person who rarely wears jewelry, I posed a great challenge to my now-fiancé when shopping for an engagement ring. The customized ring from Robbins Jewelers that he proposed to me with was perfect and really suited me personally to a tee - I feel so special when I wear it! Thanks Mitch for helping create such a beautiful symbol of our love. Needed a repair - Mitch took care of it and when there was an issue 2 weeks after the repair was complete he responded quickly and managed the adjustments at no additional cost to me. Very customer focused. Thanks Mitch! The custom engagement ring and wedding band that Mitch created for me are amazing! He understood what I was looking for and the end result was even better than I had anticipated. Having them made was easier than I thought it was going to be and my husband and I couldn't be happier with the results. "The custom engagement ring and wedding band that Mitch created for me are amazing!" Mitch is my first stop (usually my only stop) for all things jewelry / watch related. Great service fair prices and extremely knowledgeable. Bought Vickie's engagement ring from him ..... many decades ago. When it comes to jewelry, he's the guy! "When it comes to jewelry, he's the guy!" ​One of the best in the business - highly recommended !!! "Two engagement rings from Mitch!" ​Two engagement rings from Mitch! Yep!! Two! !